It's DISNEY BLOG HOP time, guys!! Mouse on the Mind and This Happy Place Blog are continuing their Kill - Refurb - Marry series, in which you can pretend you are an important head honcho with the power to make Disney decisions for a day. Last time it was Disney World Resorts, this time we're looking at Crescent Lake Restaurants! Probably this is a biased choice because, to be honest, I still miss Spoodles. It just had a cool name. And it was just all around cool. For a long time I was indifferent to Kouzzina, but after a very bad breakfast experience this past summer, I'm willing to put it in the Kill category. I don't like the two Cat Cora faces staring at me as I walk down the Boardwalk, and while the décor is pretty, it's somehow underwhelming. The memory of a certain disappointing whole wheat croissant is also making me SO NOT regret this decision. I never thought I'd meet a croissant I didn't like, but that one was just...so wrong. I want something new and fun here. WITH REAL CROISSANTS. YES. The Boardwalk Bakery was just recently refurbed, and though this may sound ridiculous, I want a re-do!! The cupcakes are still as beautiful as ever, and I like a lot of the new additions to the menu, but I don't like the interior now. I mean...I guess it's ok...but it's kinda dark, and you're basically caged into this loooong corral for the line so you can't even get a good look at the treats until you're right up at the counter and have to make rushed, last-minute decisions about what you want. When I remember how lovely it used to be, with that big, sunny, shining, open kitchen, and I could watch all the delicious things being made...it had that pixie dust. Now I don't feel it so much. I don't want it exactly the same...they did need more space for the line, but I'd still like to save some room for that open kitchen that made it so magical. And though Disney for some unfathomable reason seems to think indoor counter service seating is unnecessary these days (**cough**Main Street Bakery Starbucks**cough**), gosh darn it I want some pretty indoor seating at the Boardwalk Bakery!! Seriously how cute is that? 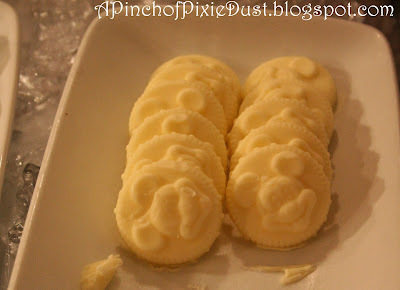 I want that butter mold! Be sure to check out the other blogs participating the blog hop too! What would YOU do with Crescent Lake Restaurants if you had the power? I almost chose Captain's Grille as my marry. I really do love it and it seems to be overlooked so often. I only have to disagree with Kouzzina as I love it! But I guess a bad experience can happen anywhere and one is enough to make you not want to go back. I get it. I haven't had breakfast at Kouzzina, but I loved dinner!